Demand only the best in compressor control. With this easy-to-use, compressor control system, plant operators are empowered to master one of a facility’s highest operating expenses—energy costs. Savings are achieved through the Regulus operating system’s superior pressure control capability, responsible for eliminating excessive air blow-offs to the atmosphere while efficiently responding to changing air demands. Advanced control modes, including auto dual and suction throttle, add operational flexibility and efficiency. Managing your compressed air system has never been easier with the Regulus control system. Supervisory capabilities include monitoring essential system components including cooling towers, dryers, pumps, motor control centers, and other auxiliary equipment, from one location. Data storage and trend viewing are instantly available with the touch of a finger. 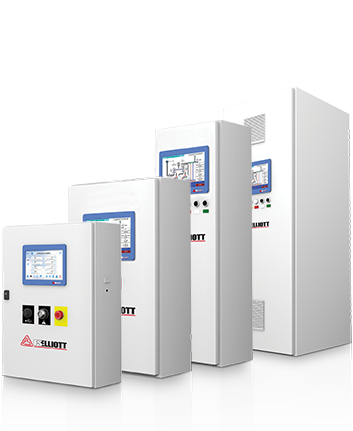 Featuring the most powerful processors in the industry, the Regulus® line offers unprecedented compressor control, providing reliable, efficient operations and substantial energy savings at facilities around the globe. Industrial markets, such as food and beverage, automotive, pharmaceutical, and mining and textile, demand peak performance and maximum efficiency in a compact, cost-effective package without compromising on the feature set. For applications requiring customized solutions to meet demanding specifications, the Regulus engineered series is the control system of choice. Typical engineered installations include oil refineries, gas-processing plants, and chemical and petrochemical facilities. For additional information, please select from one of the Regulus models below. The Regulus control system includes a comprehensive group of standard features, along with an extensive selection of hardware options to provide powerful and reliable compressor control for a variety of industries. Centrifugal air and gas compressors for air separation units. Centrifugal air compressors for the food and beverage industry. Centrifugal air and gas compressors for industrial manufacturing. Centrifugal air and gas compressors for oil refineries. Centrifugal air and gas compressors for the textiles industry. Search for authorized FS-Elliott sales and service providers in your area.